Animonda Carny Ocean is a complementary food for adult cats. The light food has tasty fish flavours and is easily digestible. Available in 6 different flavours. Animonda Carny Ocean is a complementary food for adult cats. 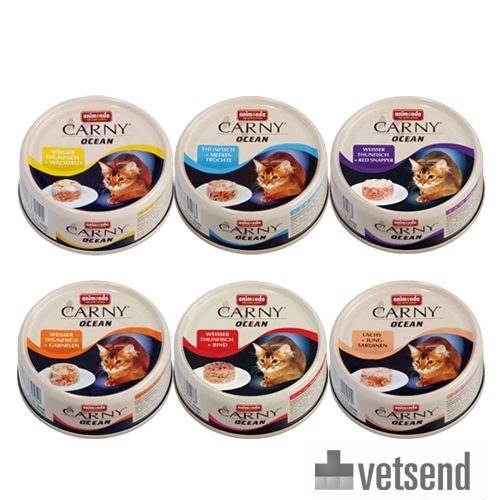 The light food has tasty fish flavours and it is especially suitable for house cats that don't get much exercise. The fish proteins are easy to digest as fish contains little connective tissue protein (connective tissue protein is more difficult to digest). Fish also contains essential amino acids that are easy to digest. Animonda Carny Ocean contains natural taurine. Cats cannot produce sufficient taurine on their own. A lack of taurine can cause deterioration of the retinas. This can lead to decreased visual acuity, dilation of the pupils and eventually blindness. A lack of taurine can also cause cardiovascular disorders. White Tuna + Prawn: White tuna (45%), prawns (7%) and broth. White Tuna + Quail: White tuna (36%), quail (12%), vegetables (3%) and broth. White Tuna + Red Snapper: White tuna (45%), red snapper (7%) and broth. White Tuna + Beef: White tuna (45%), beef (7%) and broth. Tuna + Seafood: Tuna (48%), prawns and squid (6%) and broth. Salmon + Young Sardine: Salmon (49%), young sardines (2%) and broth. Analytical information: Protein (11%), fat (1%), crude fibre (0.4%), crude ash (2%) and moisture (83%). No soy, artificial colourings or preservatives. Have you used Animonda Carny Ocean before? Let us know what you think about this product. Both of my cats are extremely fussy , however my little one loves Animonda Carney Ocean , as both of them only eat fish . It is brilliant that I found your company , which offers the Animonda with fish . Thank you. Very pleased with my purchase , as one of my cats loves the food . Will buy again . Thanks .